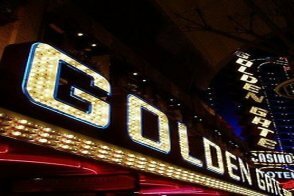 Hailed as Las Vegas' "Most Historic Hotel," the Golden Gate Hotel & Casino in downtown has stood the test of time and then some. 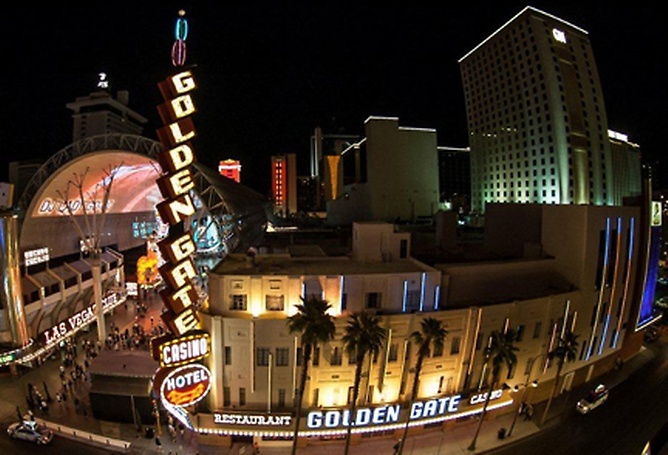 Since opening as the Hotel Nevada in 1906, this corner establishment has stood placidly at One Fremont Street while the city -- and the world -- changed around it. Most notably, Fremont Street Experience with free light shows and special events was built right outside its doors. In the casino, guests will encounter the resort's signature "dancing dealers" from 6 p.m. to 2 a.m. nightly. The Bar Prohibition! in the casino is the place to go for a cocktail. With a classic speakeasy vibe, it boasts having once served Frank Sinatra and Sammy Davis Jr. The One Bar with its bikini-clad and flair bartenders is also a great gathering spot located outside on Fremont Street. Very little has changed to compromise the Golden Gate's old school charm. 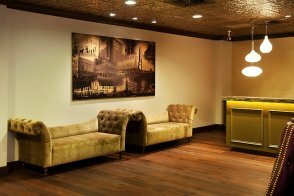 The décor elements harken back to the Roaring '20s or the Rat Pack era, while the latest technology has been utilized to bring the hotel into modern times. 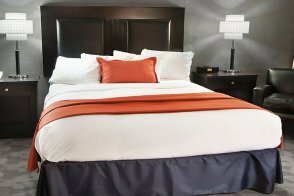 The existing 106 rooms have all been updated and now include hip amenities like 32-inch flat-screen televisions, Keurig coffee makers, pillow-top mattresses and iHome clock radios. The hotel has opened a five-story tower that is home to 16 luxury suites, including two penthouses that cover the fifth floor. It also features a porte cochère for valet parking and the hotel's exterior has contemporary pinstripe lighting accents. Yes. Casino games including blackjack, craps, roulette, slot and video poker machines. The resort recently opened a new high-limit gaming area with three blackjack tables. The "dancing dealers" are also a signature at the property. No, but a sports betting kiosk is available. The Golden Gate has no dining options in the hotel. No, but Fremont Street Experience including a stage with live nightly entertainment is right outside the doors. Yes. Bar Prohibition! is a classic casino bar where Frank Sinatra and Sammy Davis Jr. once drank. 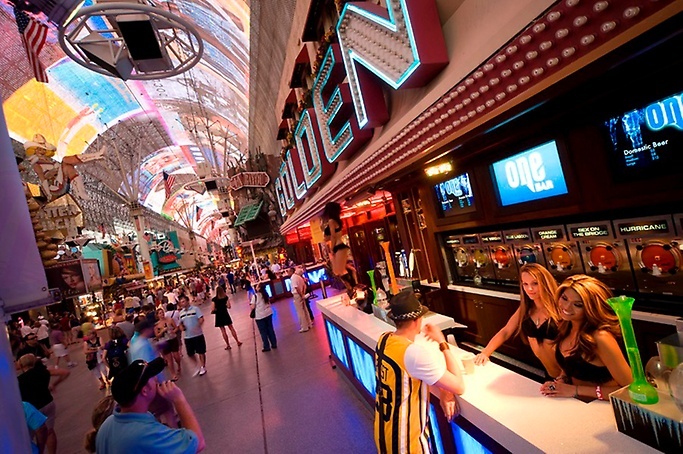 Guests will also enjoy the One Bar with bikini-clad bartenders and flair bartenders outside on Fremont Street. No, but the property is located directly on the Fremont Street Experience. No, but souvenir/logo items can be purchased on the premises. Maid service and wake-up call. No, but free valet parking is available. No, but the hotel is not far from bus stops for the The Deuce and the Strip & Downtown Express routes. Hotel requires a credit card and a $100 deposit on the card for security/incidental charges. 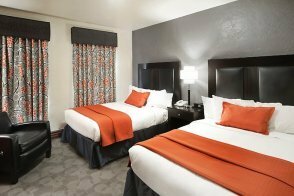 Resort fee Golden Gate Hotel and Casino has a $28.25 per room, per night resort fee. This fee is not included in your reservation and will be collected by the hotel. This 160-180-square-foot standard room has one queen-sized bed with a pillow-top mattress. 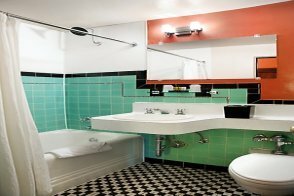 It is decorated in an art deco theme and comes with a hair dryer and in-room safe. Select rooms overlook Fremont Street Experience. The bathroom has either a shower only or a shower/tub combination. This contemporary suite measures approximately 500 square feet. It has a California king bed with a pillow-top mattress. In addition, there's a sectional sofa with a pull-out queen-sized bed. The suite is decorated with an art deco theme and features eye-catching vintage artwork. Other amenities include a 50-inch flat-panel TV, an iHome clock radio (compatible with both iPhones and iPads) and a comfortable work space as well as a hair dryer and an in-room safe. The bathroom has a shower with a rainfall showerhead.